U.S. Congressman Joe Sestak (D) represents Pennsylvania’s 7th Congressional District, which includes most of Delaware County, southwestern Montgomery County and eastern Chester County. 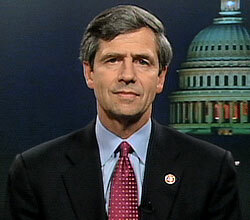 The Philadelphia Jewish Voice first interviewed Sestak when he was running for Congress in 2006. The following are excerpts from an interview with Rep Sestak that took place on May 20, 2009. PJV: Are you still weighing the possibility of challenging Arlen Specter in the Pennsylvania senatorial primary next year? I am definitely considering running --- on the issues that are important to Pennsylvanians --- from healthcare to the economy, to jobs, defense, and education. For me, it is not about who I may be running against, but what I would be running for. Frankly, I was disappointed in the Democratic establishment in Washington, which I do have enormous respect for, because it should be left up to Pennsylvanians to decide who their candidates should be. For the time being, I am waiting to see if Arlen will be running for the right things and if he can be relied on to stay consistent with the things the Democratic Party stands for. I owe that much to the establishment. But we cannot have someone in that Senate seat who is not going to be fighting consistently for the right issues. So yes, I am strongly considering getting into the race, but again, it is not about running against Arlen. It's about running for those issues that I care about. PJV: Speaking of Democrats, what is the reaction to those who joined with Republicans in Congress to block funding to close the facility at Guantanamo Bay? I support what the president is trying to do with Guantanamo. Technically, you could keep Guantanamo open, so long as you could ensure due process and the right of habeas corpus, and I introduced a bill last year to do just that. But I agree with President Obama that we have to close it because it has become a negative symbol around the world --- and symbols are important. So I wish we could have approved the funding to close it. The fact is, we can safely jail terrorists in facilities in the U.S. like Fort Leavenworth and the super-maximum prison in Florence, Colorado. One thing we know how to do in this country is keep people in prison. PJV: On a related matter, to what extent, if any, has Speaker Pelosi's effectiveness been compromised by her statements about when and if she was briefed by the CIA about torture? I do not think that there has been much real harm done here in Washington, D.C. However, I strongly believe that when an issue of accountability comes up about who knew what and when, a thorough review would help uI do not think that there has been much real harm done here in Washington, D.C. However, I strongly believe that when an issue of accountability comes up about who knew what and when, a thorough review would help us get to the bottom of the issue. The end result is that Americans get better government. PJV: Does that mean you are in favor of a Truth Commission? I would not call it that, but we do need a commission, one outside of Congress. I agree with the president that we need to move forward, but we also must have accountability. I have a military background so I use the analogy of what happens in the military when we lose an aircraft. We have two investigations. The first is a legal investigation to determine if criminal negligence played a role in the loss of the aircraft. But we also have a second review where people are granted immunity so that we can get to the bottom of the problem and learn lessons to prevent future losses. That is the kind of hearing we need. And not just to investigate the White House, but to investigate Congress as well. And it needs to be outside of Congress because at the moment it is like the Hatfields and the McCoys on the Hill right now, a lot of he-said,she-said partisanship that Americans are getting tired of. PJV: A generation ago, President Johnson's prosecution of the Vietnam War hampered his ability to fully implement his ambitious social agenda. Does President Obama face a similar challenge with the war in Afghanistan? First, it is not really about Afghanistan; it is about Pakistan. Al Qaeda has a safe haven in Pakistan and we need to eradicate it for our national security. Unfortunately, the president has been dealt a weak hand because he can only affect matters there marginally. Our combat forces are not permitted there --- the local population would not tolerate it. Another reason is the factions that divide Pakistan's political parties, military and intelligence communities. In an odd way, the presence of radical Taliban forces in the Swat Valley and their proximity to Islamabad may be the wake-up call those Pakistani factions need to start working together to preserve the future of their government. Of course, Afghanistan is part of the problem. The one-fifth of the Taliban who have joined with Al Qaeda there serve as base of support to the radical elements in northern Pakistan. The key there is to have an exit strategy that the public is aware of, a timetable, and a sense of what the benchmarks might be to determine success or failure. I am willing to support the administration, but we have poured a lot of blood and treasure into the area and we will need to have an exit strategy. PJV: Turning west to the Middle East, the administration is focused on a two-state solution to the conflict between Israel and the Palestinians. But who is Israel supposed to negotiate with to reach such a solution with Hamas in control of Gaza and the Palestinian Authority in power in the West Bank? The dilemma is that the U.S. has been absent from the peace process for the past eight years and Israel has been left alone. She withdrew from Gaza on her own and that withdrawal might have had a better outcome had it been accomplished under a U.S.-led international effort that recognized the threat Israel faced from constant rocket attacks from Gaza. But we have to start somewhere, and I believe that means negotiating with the Palestinian Authority in the West Bank. PJV: But Prime Minister Netanyahu seems more concerned with the Iranian threat at the moment. I understand Netanyahu's concern about a nuclear Iran, but I do not think that takes priority over reaching a deal with the Palestinians. I think both have be dealt with on a dual track, with George Mitchell working with the Israelis and Palestinians, and Dennis Ross making headway with the Iranians after the June elections there. If we can make some headway with Iran, we will make it easier for Netanyahu and the Palestinians to get back to work implementing the Road Map. The key is for the U.S. to remain fully engaged. Another key may be to get Russia to put more pressure on Iran. We might facilitate that by coming to an agreement about the missile defense systems we have proposed installing in Poland. We really do not need it. We can accomplish the same thing with Aegis-equipped ships that could also protect Israel from missile attack. In fact, I recently had discussions about this with General Buchris, the head of Israel's missile defense organization. My point is that we have to stay fully involved and take a broad view that considers the entire region and works towards a comprehensive solution.